Spanish in a Sophisticated City! Location & How to Get Here: direct flights from 15+ cities in the USA, 7 in Canada, 6 European cities and almost every major Latin American city. Attractions & Things to Do: from fine dining, shopping and a sophisticated nightlife to nature, history, culture, art, fashion, music and sightseeing. Weather & Seasons: dry season from December to April (rainiest months September to November). Temperatures from 70° to 90° F (20° - 32° C). Neighborhoods, Transportation & History: a modern metro system (subway), taxis and buses will get you around Panama City's districts. Habla Ya Panama City is an Official DELE Examination Center. What's it like to study at Habla Ya Panama City? Panama City is located in the southern terminal of the Panama Canal, in the center of the country. It's bordered by the Pacific Ocean to the South, the Panama Canal to the West and dense tropical rainforest to the North and East. 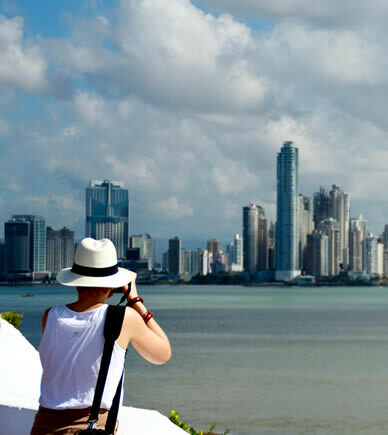 Panama City is home to over 1 million people and can be reached through direct flights (PTY airport) from over 15 cities in the USA (only 5 hours from New York), 7 in Canada, 6 European cities and almost every single major city in Latin America (including the Caribbean, Mexico, Central and South America). Travelers also arrive to Panama City by land from the Western parts of Panama (Bocas del Toro and Boquete mainly), Costa Rica or by ferry boat from Cartagena, Colombia (previously arriving to the city of Colon, the northern terminal of the Panama Canal - this ferry also travels from Bocas del Toro). Flying into Panama City is pretty straight forward. Once you land into Tocumen Airport (PTY), the city center is about a 30 minute drive away (during rush hour it could take up to an hour). A taxi from the airport to the Cangrejo/El Carmen area, where Habla Ya Panama City is located at, should cost around $35. We can also arrange an airport pickup, in which case a known driver will be waiting for you with a sign with your name on it. The Panama Canal, one of the Seven Wonders of the Modern World, is amongst the greatest civil engineering achievements of the 20th century. For the last 100 years the Panama Canal has been connecting the world and is the preferred waterway for vessels to navigate from the Pacific to the Atlantic Ocean (and viceversa). You'll be able to witness how the Canal's system of locks raise and lower humongous ships and you'll learn how the expansion of the Canal will double its capacity and allow even larger vessels to go through. The Panama Canal has an enormous geopolitical, strategic and financial role in the worldwide economy. 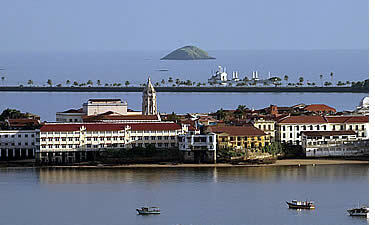 Declared a World Heritage Site by Unesco in 1997, Casco Viejo is Panama City's historic neighborhood, consisting of charming buildings mainly of 16th and 17th century Spanish colonial architecture, in different stages of renovation, and is encompassed by a massive sea wall built in 1670 to the defend the city from attacking pirates. The Old City Quarters is the perfect place to wander around and discover its many churches, plazas, museums and theatres. 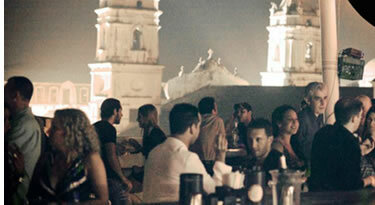 After dark in Casco you'll also encounter some of the City's finest restaurants and trendiest nightlife venues. The area also hosts a large number of cultural events such as concerts, operas, musicals, fashion catwalks, etc. Also worth checking out is the "Mercado del Marisco". The Amador Causeway, linking four small islands (Naos, Culebra, Perico, Flamenco) in the city's bay, offers breathtaking views to the most spectacular skyline in Central America, a yacht covered panorama with the Bridge of the Americas as its backdrop (entrance of the Panama Canal), and is a favorite among locals to cycle, run or just hang out at night in one of its pleasant ocean-side restaurants or bars. The Museum of Biodiversity, by renowned architecture Frank Gehry, will help you understand and appreciate Panama's natural beauty as it tells the story of how the isthmus rose from the sea, uniting two continents, separating a vast ocean in two, and changing life on Earth forever. Its 8 main exhibitions celebrate Panama's biodiversity, which make it one of the world's richest ecosystems with more bird, mammal and reptile species than the United States and Canada put together. Here you'll find the ruins of the first Spanish city founded on the Pacific Ocean. It was burned down in 1671 by Welsh pirate Henry Morgan. Most of the city was lost since most of Panama Viejo was made of wood, so what remains are the the ruins of the few stone buildings that were left standing. 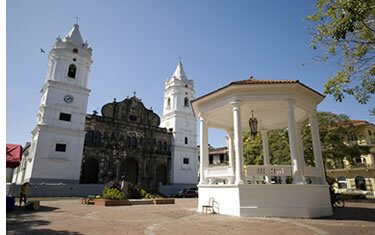 The best preserved structures are the cathedral tower, which has come to be one of Panama's national symbols, the plaza next to it, and the bishop's house. Also worth visiting is the site's museum and the artisan market located next to it. Being Panama City the melting pot it is, you'll be able to experience fine cuisine from all over the world. Panama City's restaurants are among the best thing the city has to offer. There are plenty of great options in every price range, from cheap Panamanian food, and midrange seafood venues and steak houses, to upscale Italian, Peruvian, Indian, Asian or French. Many of the fancier restaurants are located in the Calle Uruguay or Cangrejo area. 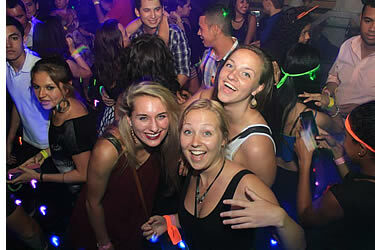 Arguably Central America's most sophisticated nightlife scene, the most popular areas for a good party in Panama City are Casco Viejo, Calle Uruguay, El Cangrejo, Amador Causeway and the Business District. Partying is one of the very few things Panamanians take seriously and in Panama City you'll find something for everybody's taste. From let your hair loose anything goes backpacker joints in Casco Viejo, salsa clubs and euro style pubs in El Cangrejo, to classier night clubs with enforced dress codes in Marbella. For a truly out of this world party experience, don't miss one of Panama City's rooftop bars. Gambling is legal in Panama, so there is no shortage of casinos in Panama City as well. You don't even have to leave the city to experience a tropical rainforest. The Metropolitan Natural Park is just a 15 minute drive from downtown and has about 4 kms of hiking trails spread among three main loops. As a highway cuts right through the park, wildlife observation is a bit limited. Luckily enough Soberania National Park and the famous Camino de Cruces and Pipeline Trails are easily accessible, where some of the world's best birding takes place and you can encounter sloths, iguanas, howler monkeys, white-faced capuchins and many other species if you head out early enough. Panama City's grandest avenue was recently upgraded to include a pedestrian friendly area built on landfill over the ocean. 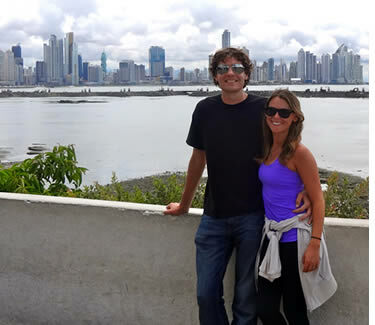 The Cinta Costera goes from Casco Viejo all the way to Punta Pacífico and offers great views of the skyline. Parks, sports fields, a skate park, and parking areas are all part of the upgrade. 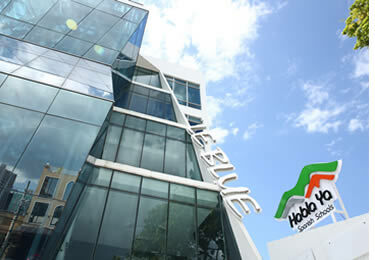 In Panama City you'll be able to find clothes, electronics and goods from all over the world at really good prices. For big shopping trips, many citizens from our neighboring countries come to Panama City thanks to its immense variety of stores and fabulous prices. Possibly the most popular mall in Panama City is Albrook Mall (it's said to be the largest in Latin America), with nearly 1000 shops. Albrook Mall has several department stores for shoppers on a budget as well as more exclusive brands. SOHO Panama and Multiplaza Mall are certainly classier and designer brands from the most famous fashion capitals of the world have presence at both. Other malls include Multicentro, El Dorado, Los Pueblos and Metro Mall. This is your opportunity to experience the oldest transcontinental railroad in the world. Operated by the Panama Canal Railway Company, it provides passenger and freight service between Panama City and Colon, the northern terminal of the Panama Canal. 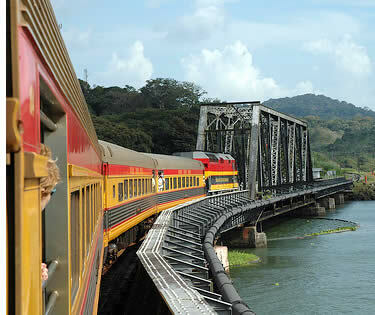 Along with its colorful history, the railroad follows a picturesque path across the Isthmus of Panama. 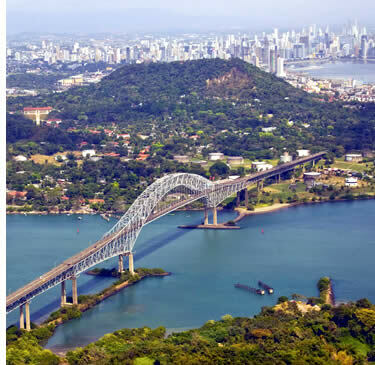 The line flanks the Panama Canal passing through lush rainforests, cruising alongside the Canal's locks, through the historic Gaillard Cut and gliding over slender causeways in Gatun Lake. From Colon you can go to Portobelo. Portobelo is a sleepy port city with a deep natural harbor. The ruins of the Spanish colonial fortifications, along with nearby Fort San Lorenzo, were declared a UNESCO World Heritage Site. In Portobelo you'll find Panama's first customs building, a small but interesting local museum, the church of the famous Black Christ of Colon and the local beach. Here you'll have the opportunity to learn more about the Embera's history, culture, dances and traditions, and you'll also be able to buy traditional Embera craftwork. The Embera–Wounaan are a semi-nomadic indigenous people in Panama. They live in small villages of 5 to 20 houses along the banks of the rivers throughout the Chucunaque/Tuira/Balsas River watersheds in the Darien Province of Panama. There are generally three villages on each tributary that branches off from the main river system. Each village is about a half day's walk apart. The villages are built on a small rise, set approximately 100 feet in from the river. The houses of the village are set about 20–50 feet apart atop the rise on posts, with no walls, but tall thatched roofs. Around each village, the jungle is partly cleared and replaced by banana and plantain plantations, a commercial crop for the Embera, who sell them to get cash for their outboard motors, mosquito nets, and the like. 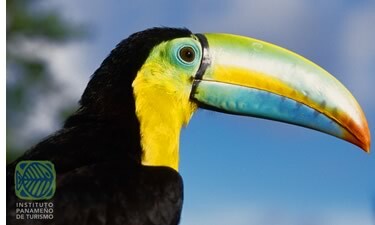 Gamboa is one of those special places close to Panama City where you can discover Panama's wildlife. Your first trip will be by boat to Monkey Island. Here you'll always be able to see troops of capuchines and learn all sorts of interesting facts about the Panama Canal and its history. 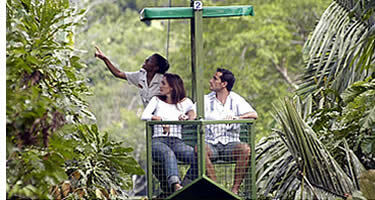 Once you're back on land, you'll be able to explore the canopy of the rainforest via the longest Cableway that exists in Panama. Just as with most international cities you'll be able to find all different sorts of options to stay fit and work out. In Panama City there is no shortage of gyms, yoga studios and martial art groups that don't require membership and have affordable drop in rates. If you need to escape the city during the weekend, you can easily do so and venture out to breathtaking islands in Panama's Pacific Bay such as Taboga or Las Perlas Archipelago, famous for their white sand beaches and whale watching, or head towards the Caribbean islands of San Blas where you'll encounter the land of the Kunas, the most fascinating indigenous culture of the Americas. If you love cities, you'll certainly not want to leave Panama City. 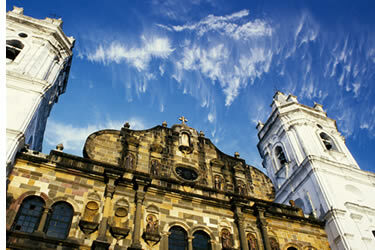 Panama City is the most sophisticated and vibrant city in Central America. 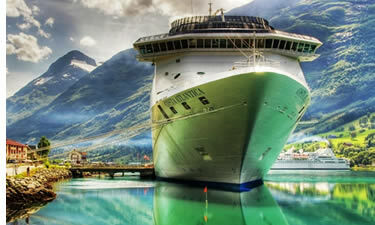 Having said that, what makes Panama as a country really shine are its natural wonders. Don't miss Boquete and Bocas del Toro! Panama City, just as the rest of Panama's Pacific coast, has two main seasons: a dry one and a wet one. The dry season goes from December to April, and the rainy season from May to November. The dry season is what Panamanians call summer and part of it is when schools are off. The dry season is also high season for tourism. The rainy season is referred to as winter even though temperatures are almost exactly the same. And within the rainy season, there are rainier times than others but for the most part storms start in the mid-afternoon and pass through quickly leaving much of the day and evening with clear skies. Storms tend to start earlier and end later in the final months of the rainy season so even if May, June, July and August are within the rainy season, it generally doesn't rain as much during those months as October and November. As with the rest of Panama, Panama City's temperatures don't change much during the year. 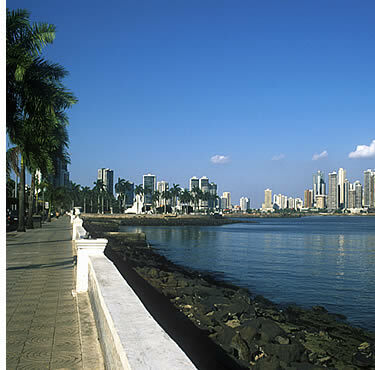 In Panama City, expect a high of about 90°F (32°C) during the day and down to 70°F (20°C) during the evenings. Due to the high ratio of concrete to green areas, middays can get very hot, especially if a short shower brings up the humidity and steam after a sunny morning. Below you'll find a chart with Panama City's mean minimum and maximum temperatures for any given month as well as average amount of rainfall. This climatological information is based on monthly averages for the 30-year period 1971-2000. 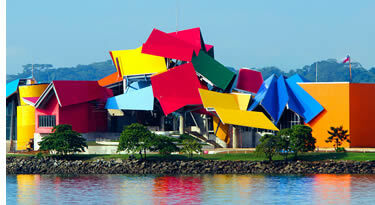 When is the best time of the year to visit and learn Spanish at our Spanish school in Panama City? The dry season (December - April) has the most pleasant weather but because it's high season, prices will also be higher for accommodation. September - November are the rainiest months and you should head to Bocas del Toro if you're in search of sunshine as it's significantly drier in the Caribbean parts of Panama during those months. The rest of the year you'll be fine rain wise and will be able to get better rates for lodging at some places. If you plan on surfing Panama's Pacific, the largest swells are from April to July, where for Bocas del Toro you should aim for December - March, June and July. It is extremely rare if Panama City gets a strong and long rainstorm during the dry season. In this time of the year you'll enjoy fresh sunny days with pleasant temperatures. The only exception might be when there is a tropical storm elsewhere in Central America. Panama is a hurricane free zone so when a tropical storm heads towards Honduras, Nicaragua, Costa Rica or any other Central American country or the Caribbean, in Panama it might be felt as some heavy rainfall, but that's it. Because of this, Panama is the safest place to be in during your Central American vacation during hurricane season, as we're completely out of it! Unlike most developed countries, addresses are usually given referenced to local landmarks as opposed to zip codes and street numbers. Most people know the names of the major streets and avenues, but apart from that, street names get trickier to get recognized as there is no logical order to them. The city is loosely organized by a series of neighborhoods of which you'll mostly encounter El Cangrejo, El Carmen, Marbella, Bella Vista, Calidonia, Santa Ana, Casco Viejo (San Felipe), Obarrio, San Francisco, Albrook, Costa del Este, Punta Paitilla and Punta Pacífica. 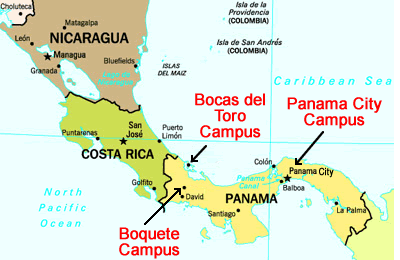 Our Panama City Spanish School is located on the border of El Cangrejo and El Carmen area. El Carmen is a middle class residential area that hasn't given into the pressures of a growing city, the zoning laws haven't changed and thus the area remains peaceful and without the high rise condos that have spread into other areas of the city. San Francisco on the other hand is another middle class neighborhood that has seen high rise buildings take over. Via España has always been the heart of modern Panama City, with the action spreading north to El Cangrejo and south to Obarrio, Bella Vista and Marbella. El Cangrejo certainly has a more touristy feel and along with El Carmen are definitely more pedestrian friendly, while Obarrio, Bella Vista and Marbella are more business type areas and have a more corporate feel. Part of these areas are also referred to as Zona Bancaria or the Banking District, with nearly 100 banks concentrated here. Most of the City's upscale hotels, restaurants and shops are within this area, as well as Calle Uruguay and its surroundings which are home to a booming nightlife scene. Avenida Central runs along Calidonia and Santa Ana districts, humbler areas where you can find good bargains. These border with San Felipe which contains the historic neighborhood of Casco Viejo. Punta Paitilla and Punta Pacífica are areas of posh condo towers, commercial centers and hotels. Costa del Este is a new area bordering the city with a mini-metropolis of upscale homes and condos, as well as many gated communities and vacation homes for the privileged. Albrook is where you'll find the city's largest shopping mall. Getting around in Panama City just got a lot easier in 2014. 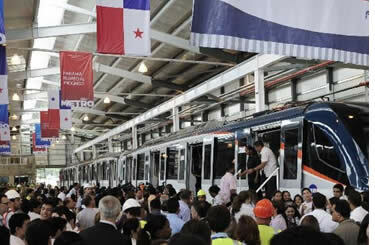 A major overhaul of Panama City's roads was completed in 2014 as well as Central America's first metro (subway). The overhaul of the roads means less traffic jams, although who knows until when this will be the case as nothing has been done yet to reduce the amount of cars circulating, and car sales in Panama City's booming economy just keeps on growing. The public buses are also being replaced and taxis are quite cheap and readily available at most times of the day (except at rush hours). A $2 taxi fare will get you to most places you'll need to go within the city and the metro (subway) is also very cheap and convenient if it's within your route. Source: Lonely Planet. Panama City was founded in 1519 by the Spanish governor Pedro Arias de Ávila (Pedrarias) not long after Balboa first saw the Pacific. 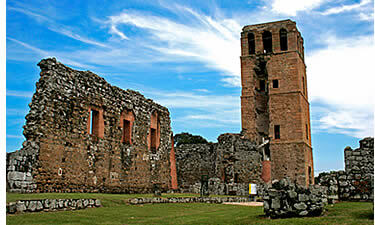 Although the Spanish settlement quickly became an important center of government and church authority, the city was ransacked and destroyed in 1671 by the English pirate Sir Henry Morgan, leaving only the stone ruins of Panamá Viejo. Three years later, the city was reestablished about 8 km to the southwest in the area now known as Casco Viejo. Although the city's peninsular location meant that it was well defended, the destruction of the Caribbean port at Portobelo in 1746 dealt a heavy blow to the Spanish overland trade route. Panama City subsequently declined in importance, though it returned to prominence in the 1850s when the Panama Railroad was completed, and gold seekers on their way to California flooded across the isthmus by train. The city's only major setback in recent times occurred in 1989, when it was invaded by the USA to oust dictator Manuel Noriega from power. The capital suffered damage both from the invasion itself and from the subsequent looting, and several residential blocks of the El Chorillo district were destroyed by combat-ignited fire. Today, Panama City is by far the wealthiest city in Central America, and residents are wholly optimistic about the future – and with good reason. Following the handover of the Canal in 1999, and the subsequent closure of American military bases in the country, Panama City is finally in charge of its own destiny. Furthermore, a spate of foreign investment and the Panama Canal's expansion means that the capital is likely to continue its remarkable boom. When we chose the spot for our Spanish school in Panama City, we did it looking for an area where you would be able to quickly move from the school to your accommodation at any time of the day. We also wanted you to be close to many restaurants and bars, as well as it being a tourist and pedestrian friendly area. This is why we chose our school's location to be in El Carmen, right next to El Cangrejo. Panama City has it all! Culture, nightlife, shopping, nature... the perfect city to learn Spanish! Contact us!